We have been researching for you one of the Elite Class hotel in Belek district of Antalya province of Serik province and we have done researches about sueno belek hoteli we share this information for you Ayrica sueno Golf and sueno Transfer of Deluxe Hotel is available on Grandtransfers.com Our services with our latest models Grand Transfers The team is yours to provide you the best service. Sueno Hotels Deluxe Belek Antalya is located in the Belek area. Sueno Hotels Deluxe Belek luxury, which is established on 1410000 m2 area, serves our guests with all inclusive concept. 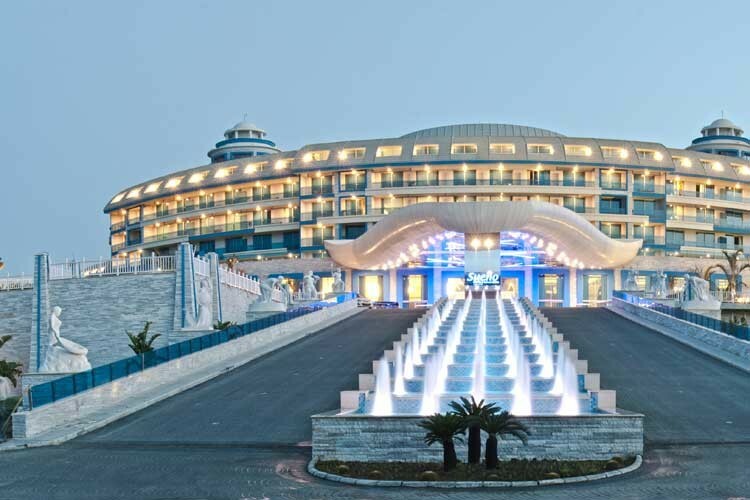 Sueno Hotels Deluxe Belek attracts attention with its location on the sea. You can enjoy the sea on its 220 m long beach. The resort has its own private beach, sand and pebbles. The facility offers a special service to its guests with 6 ala carte restaurants. You can enjoy a pleasant holiday with 4 indoor swimming pools. You will have fun on the beach with banana, sea bike, jetski, canoe, catamaran services. There is a parachute for holiday lovers. You can have a good time playing soccer, billiards, tennis and bowling. The on-site spa offers relaxing massage services and you can feel refreshed. Doctor, photographer, beauty salon, hairdresser, market services are available in the facility. For your enjoyment, there is a bar. The hotel is 30 km from Antalya Airport and 5 km from Belek.